Dexter is a Showtime series about a forensics expert that secretly murders guilty suspects and collects samples of their blood. This is the game of that show made by a clothing designer. Yes, Marc Ecko – that Marc Ecko – has expanded his efforts from rhinoceros-branded jackets and hats into iPhone games. Dexter for the iPhone isn't exactly his game label's first effort at it, but it may be the only one you've ever heard of. Ecko hopes to "scale up" Dexter to the Wii and later Xbox 360/PlayStation 3, which will be the first instance of reverse game development that I've ever seen if it happens. Dexter for the iPhone is an adventure game that can be played in the first or third person. You play as the title character, a guy who runs around "solving" crimes as part of the police department and then takes justice into his own hands by offing the suspected criminal and storing a sample of their blood in his air conditioning unit. In the midst of GDC chaos, I found myself in the awkward position of having to run eight blocks through downtown San Francisco with about 11 pounds of journalistic equipment on my back to make it to the 30th story of a posh hotel to spend exactly 20 minutes with the title before running another two blocks to go sit through this. If there were such a thing as pre-pre-Alpha, the build I saw of Dexter would be it. I'm giving Ecko the benefit of the doubt, since his games label hasn't had much experience in development – but I couldn't stop myself from wincing when my demo master said the game was 20% done and then proceeded to show me a level with no collision and no objective, purely so I could walk Dexter around and… well, just walk him around. You could call fake levels like this proto-tutorial, but I call it a waste of time for a games journalist to see. Lose the Accelerometer: There are several different ways you control motion in Dexter. The default is a set of two buttons that turn Dexter's body or the camera one way or the other, while the accelerometer (tilting the iPhone) actually controls his walking or running. It works in that Dexter does move when you tilt the iPhone, but it's broken in that it makes no sense to move the character like that. My demo master sure seemed to have the hang of it, but I don't think I've ever played any game with a less intuitive control system than if my keyboard had been dipped in concrete and then thrown down a well. Improve the User Interface: The only UI you see throughout the game is a Mask score, which is a meter that determines how unsuspicious of Dexter the world is. The rest of the time, you don't have a map, an objective arrow or even a noise detector during the sneaking missions to help you out. The game is pre-pre-Alpha, so I'm hoping this will come together. But for now, it's definitely one of the things that needs the most work. "Use the iPhone in a sawing motion" What? : Not even blowing into the DS mic will embarrass you as badly as Dexter if you happen to be playing the game in public. 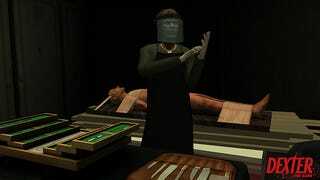 A crucial portion of the game requires Dexter to off his victims in various ways. My demo master was fond of the bone saw, and when killing time came, the game asked him to turn the phone on its side and actually make a sawing motion with it while the screams of the victim blared out of the speakers. Can you picture doing this on an airplane?! Integrate the Mini Games: Dexter has a lot of potential to work in mini games. It's not that Ecko hasn't thought about them, it just seems like they haven't figured out which ones are the most important. For example, there are requisite sneaking missions that play out like mini games (get to the end of the hallway without this guy seeing you), but the actual mini game of identifying murder weapons via blood splatter patterns doesn't seem to be required or even integrated into the main game. For the record, that blood splatter game was way more fun than the sneaking – and doesn't Dexter have to do some work for the police to keep the façade up? The virtual joystick: Some of the testers on the game complained about the accelerometer controls, so Ecko included a secondary control scheme where a virtual joystick appears in the lower left hand corner of the phone (when it's turned on its side). This felt way more intuitive to me than the default controls and I'm even tempted to say they should add a second virtual joystick on the right hand side so that we finally have a handheld system that does what we wanted all along: controls almost one-to-one like a console game. The fidelity to the show: I've got to hand it to Ecko; they aren't creating an utter bastardization of a show just to make a quick buck (sheesh, quick? This is an iPhone game that's been in development for more than a year and they're still in pre-alpha…). It sounds like they're working closely with Michael C. Hall to get the characterization down and the cut scenes for the game were crafted by one of the show's writers. I'm skeptical, but I see some good ideas going on here. The virtual joystick alone is a moment of "eureka!" for iPhone games. But trying to cram a console game's worth of stuff into one game sounds a little ambitious, not to mention ominous for your iPhone's batter life. Ecko plans to split the game up into three installments for the iPhone which would then be merged into one game for the move to console – if they make it that far. It may be that the clothing designer has bitten off more than he can chew both with the Dexter franchise and with the nature of iPhone gaming.